Just when we were all relaxing and thinking our steamy summer was here to stay…it started raining. 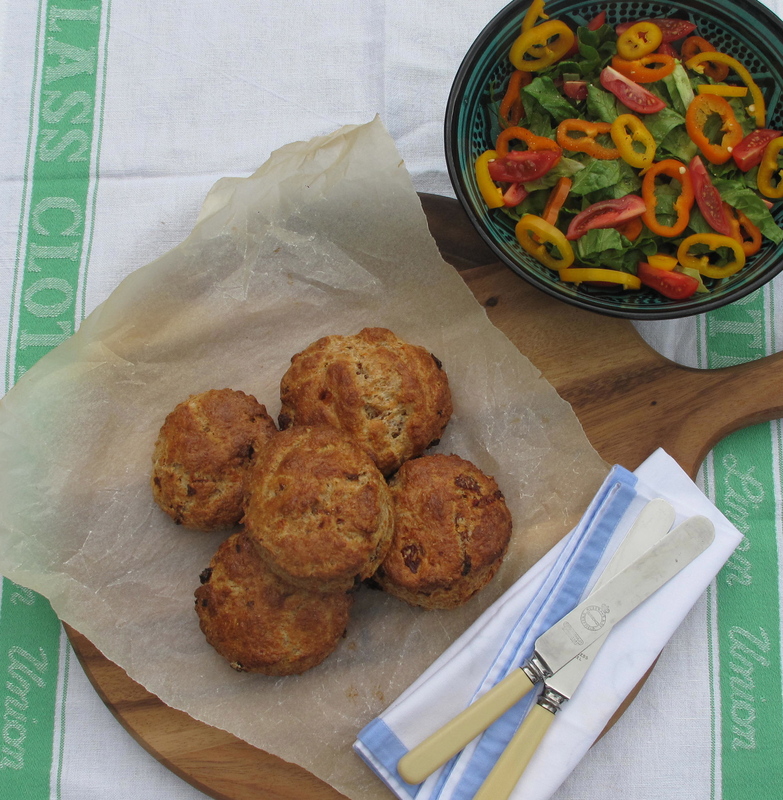 Bored of salads, which don’t quite taste the same with an overcast sky, savoury scones are an all-in-one lunch, requiring little to accompany them except maybe a fresh, green salad. 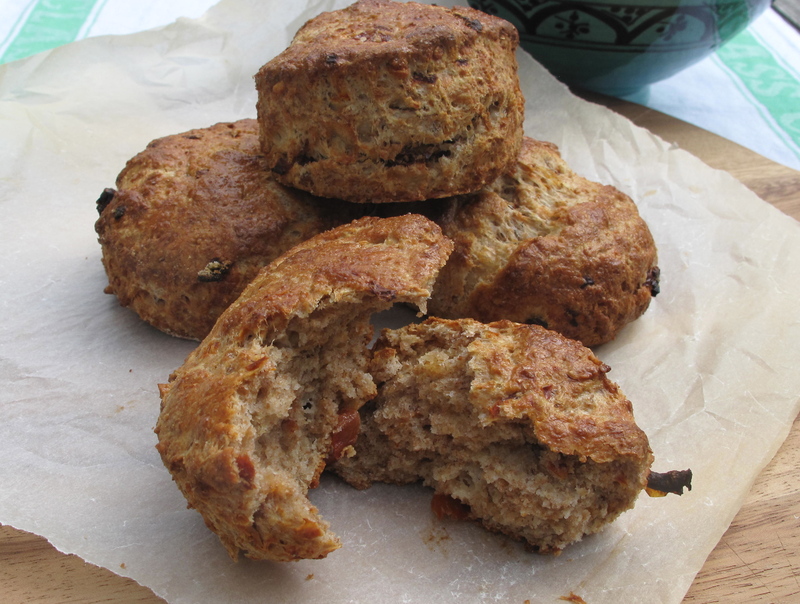 Wholemeal flour not only makes them healthier, but gives a nutty taste that complements the savoury cheese, whilst the rich sundried tomatoes adds a warmth that tastes less British afternoon tea, more Mediterranean summers… Add whatever you fancy- lightly caramelised onions, black olives or chives. Is there anything nicer than a scone that’s still warm from the oven spread with melting butter? No, I think not. Sift the flour, baking powder, salt and sugar into a roomy bowl. Add the butter. Now the key to making a seriously good scone is keeping everything as cold as possible- put everything in the bowl in the fridge if possible for 20 minutes or so before making, and run your hands and wrists under cold water. Secondly, don’t over-work it or over-handle the dough at any stage! Rub the butter into the flour using your finger tips- work quickly- until it resembles breadcrumbs. Keep your palms facing upwards as the rub it together- this encourages cold air into the bowl. Add your other dry ingredients- the cheese and tomatoes or whatever else you’d like. Next, pour in the milk slowly, and mix the mixture with open fingers gently around the bowl until it starts to come together. Continue, gently forcing it into a dough. Tip onto a lightly floured surface and knead a couple of times until it’s a smooth. Don’t roll the pastry out- just pat it gently with your hand until it’s about an inch thick. 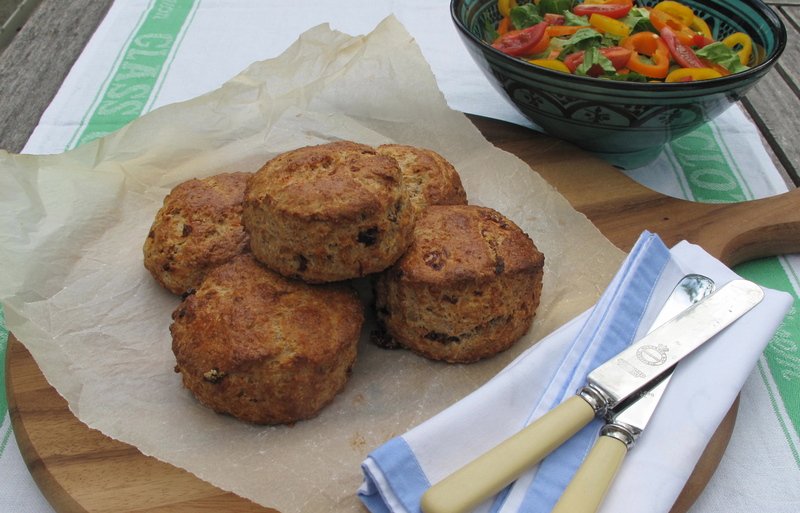 Take your cutter, dunk into the flour, and cut out your scone, before gently placing on a lined baking tray. Gently brush with a beaten egg, and put in the oven for around 10 minutes until risen and golden. This entry was posted in Baking, On a Budget, Quick and Easy, Vegetarian and tagged Baking, cheese, salad, scone, summer, sundried tomatoes. Bookmark the permalink.